Cricket fans and team management get swayed easily whenever a player shows ability in another discipline than the skill they have been chosen in the team for. Teams are constantly on the lookout for a batsman who could capably bowl 10-12 overs in a day, or a bowler who has the nous to bat at No 6 or 7. When the see even a tiny speck of indication that they may have someone who could do that, they get fast-tracked to the national side. Four years ago, Ashton Agar was sent to India ahead of the Australian Test squad “on an internship” as one of the six Australian Institute of Sport (AIS), and was expected to train a bit ahead of the first Test with the national side before heading to England to do the same, as the national side was headed there after the India leg for Champions Trophy and the 2013 Ashes. At the last minute, he was held back and played two tour matches against Board President's XI and India A. Rumours swirled that he might get a surprising Test debut at Chennai. Even though he had played only a couple of Shield games until then (taking eight wickets), but reportedly, his “mature approach and skill in the field and with the bat” impressed the selectors enough to have him extend his stay in India. It was revealing, not that Agar was a once-in-a-lifetime cricketer, but Australia were desperate. They were ready to blood a fresh youngster in India — a spinner at that, throw him in the deep end, without sufficient grounding in First-Class cricket. However, he didn't make his debut and went back to home to play Shield cricket for his state, Western Australia. That tour to India went from bad to worse very quickly for the visitors, and ahead of the third Test, Homeworkgate happened. Nathan Lyon, the lead spinner, was dropped after the Chennai Test, but picked again for Mohali and Delhi. Australia went in to further meltdown ahead of the Ashes as the coach Mickey Arthur was fired and former Test cricketer Darren Lehmann was hired for the job. In a typical Lehmann bluster, he took a punt on Steve Smith and Agar, who weren't named to the original Ashes squad. Smith had a reasonable India tour and had worked on his batting technique since he was dropped after the 2010-11 Ashes. 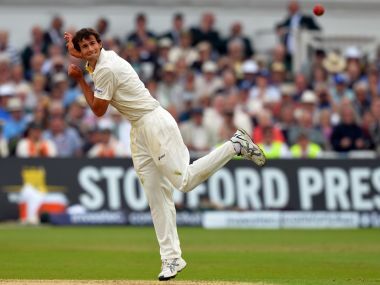 Agar, on the other hand, had a cumulative total of 10 First-Class matches by then, and on the morning of the first day at Trent Bridge, received his Baggy Green from Glenn McGrath to become the 434th player to play Test cricket for Australia. 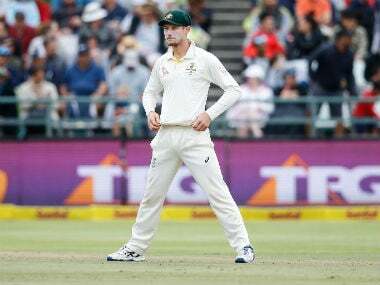 Lehmann justified the selection of Agar, ahead of Lyon who had picked nine wickets in the last Test at Delhi, because he was a left-arm spinner and that Kevin Pietersen had had some issues facing spinners of that ilk. 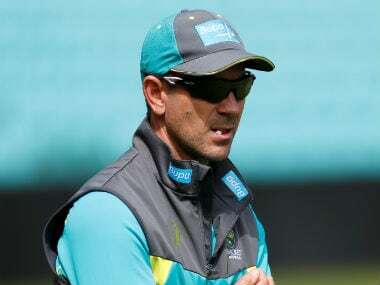 “The main reason for the selection is taking the ball away from all their right-handers and we think this is a really important weapon in particular for this Test match on that particular wicket," Lehmann said. "In the tour match, Michael [Clarke] felt he had good drift and straightened the ball nicely so that's just the way we have gone with the selectors in this Test match and we're looking forward to him playing really well." The frivolousness with which Agar was picked when looking back is mind-boggling. They were willing to sacrifice an experienced spinner, and a spot in the XI, for a possible psychological move to combat Pietersen. They were that desperate, no two ways about it. Agar took no wickets in his seven overs in the first innings and two wickets in five-over toil in the second innings. In between those two, he batted freely to score 98 runs from position 11 that staked Australia a lead of 65 runs. The world was smitten with Agar. He received promotion in the batting lineup to 8 in the second innings as Australia tried to chase 311 runs but failed by 14 runs. The final margin made Australia believe they were better then they actually were. Notwithstanding the fact that Agar had only taken two wickets in 42 overs, and hence, did not deliver on the primary skill he was chosen for [and no, he didn't trouble Pietersen either], he was again picked ahead of Lyon for the second Test at Lord's. Fruitless 42 overs of spin for 142 runs, and just 18 runs with the bat, and a crushing defeat by 347 runs, meant Agar was dropped, and he hasn't played Tests since. He has since played two ODIs in 2015 and two T20Is in 2016 but his returns were nothing to write home about. He has continued to play in the Big Bash League with modest returns, and boasts an average First-Class record (114 wickets in 44 games, S/R 77, bowling average 40, batting average 26 with two centuries). He played in one of the two unofficial Tests as a part of Australia A against India A in Chennai in 2015 picking just three wickets in 28 overs. Agar was included in the squad against Pakistan for the Test at Sydney last month but didn't get to play. He later went back to be part of the Perth Scorchers who won the BBL this year. And yet, here he is, in the squad for the four Tests vs India. He certainly is behind Lyon and Steve O'Keefe, possibly even the part-time offbreaks of Glenn Maxwell, in the pecking order of spinners, and just about on par with Mitchell Swepson. Trever Hohns, the head of the selection panel, explained the reason for picking Agar in the 16-man squad: “He is a good left-arm orthodox spinner who can be very exciting with the bat and also fields extremely well. He provides us with a great all-round package." In other words, Australia have picked a left-arm spinner who has an average First-Class record to tour India because he can bat and field a bit. Once again, the pack of spinners that Australia have decided to throw at India, in India, besides Lyon and to an extent O'Keefe, is of no proven quality. At least, not yet. It again betrays any confidence they might have in the stock of spinners coming out of their First-Class system. Only imaginable reason for Agar's pick is that he could be a last-minute insurance for O'Keefe's dodgy hamstrings. Beyond that, these four Tests will only serve as a fact-finding mission for Agar, bowling in the nets, and possibly learn from talking to Ravindra Jadeja and watching O'Keefe at training.